If you buy a pair of sunglasses or ready-to-wear spectacles from many of the major online and high street shops, it's quite likely that at one stage they've passed through City University London and been examined by one man. Residing above the Fight for Sight clinic on Bath Street near Moorfields Eye Hospital in a place somewhat mysteriously known as OATS - or the Optical Appliances Testing Service to give it its full name - Henri Obstfeld is that man. 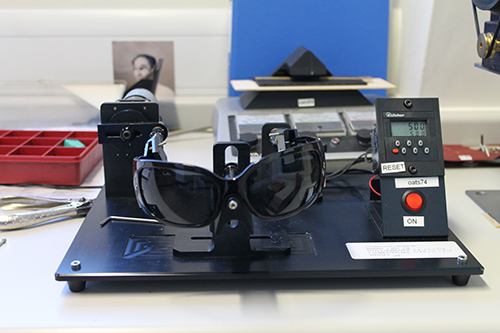 Testing over 1,300 pairs a year, many don't realise that this is currently the only independent laboratory in the UK accredited to test sunglasses to the latest standard. Meeting me in the reception of the City University London opticians, I follow the appropriately bespectacled Henri up to his lab on the top floor; a glorious little workshop tucked away from the hubbub of the University. "Most people in the Division don't know what I'm up to as it doesn't have anything to do with teaching students or research," says Henri as the elevator climbs up towards the 7th floor. "It's commercial and there are probably only two other independent labs that do this work in the UK." Once inside the lab I pass a multitude of machines, with a white plastic standard human head and neat paperwork sitting side by side on orderly benches. Around one corner near his desk sits a filling cabinet, with blue plastic boxes neatly stacked on top containing many of the pairs of glasses currently being tested. "Most people who send us the glasses are importers who sell to the big names on the high street," says Henri as he shows me round the lab and the equipment he uses to test the different glasses. "There are one or two who have their own labs like this, but there are quite a lot where you say 'oh I know that name!' when you read the labels." With all pairs arriving by post, and the local Royal Mail staff now well versed in his routine, once delivered - depending on what's been requested by the client on the relevant paperwork - testing can begin. "These sunglasses came in this morning," says Henri holding a fashionable pair that wouldn't be out of place in any high street store. "Our client sends them and tells us which tests they want done." From here they go through a suite of tests, ranging from the sides being rotated 500 times and the bridge being tested to see how much it deforms, to being placed in sub-zero conditions or a warm environment with controlled humidity. The lenses are also rigorously tested to see if they fracture using a large ball bearing dropped from a meter or so down a metal tube. Henri also tests how much - and what type - of light rays they let through, while also checking if the lenses have any imperfections which could impact on performance. While some of the machines are undoubtedly high-tech, others have a more homemade feel. "I've modified a few of these machines myself - they may not be complicated but they work," says Henri pointing to a couple of machines on one of the benches. Joining City in the early sixties, he also remembers the University from a different time. "I was a student here in 1961, so that was my first stint at City, and I've been in and out over the years. I studied Optometry in the College Building upstairs at the top. At that time there was still a Chemistry department and nothing in Northampton Square apart from a bandstand." Having qualified as an optometrist, he went into practice while later teaching dispensing opticians for fourteen years at a College of Further Education where the Cass Business School is now located. He then returned in 1984 to take up a post as a lecturer in dispensing. "It wasn't too far away from what I do now as it involved spectacle frames, lens and the equipment that comes with it. It was what I taught, so I knew about a lot of this stuff, but I didn't have a spectrophotometer as that was only for the physics boys. However, now I've got two," he says laughing. Taking early retirement in 2000, Henri stopped lecturing on the understanding that he would take care of OATS. Fourteen years later - and over a half century since he joined as a student - he is still here most days from 10am until 6pm. Started about 20 years ago, OATS was created when a local man who imported sunglasses was looking for a place which could test them to the British standard. "At the time we knew nothing much about that, but we had spectrophotometers and the necessary other relevant equipment, so we did some work for him and then we realised there was another laundry list of things to be tested and gradually OATS was established." While OATS has been running for a while, it was only in the late 90s that it was formally given its name. It has been running ever since. 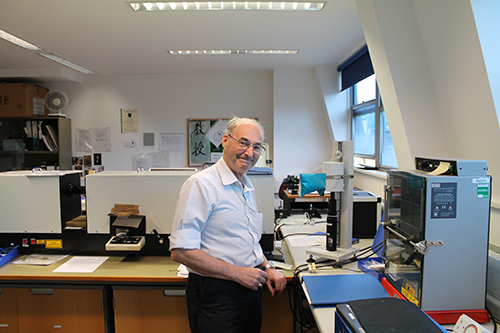 "The understanding at the time when I retired in 2000 was that I would gradually do less with the students and try and build up the sunglasses testing," says Henri. "Eventually we got accreditation from the UK Accreditation Service (UKAS). Since then we have got further accreditation and continue to test hundreds of glasses each year." Since then, OATS has gone from strength to strength, with Henri and the lab recently being accredited to test sunglasses to the new ISO standard. "Now we've got the accreditation for the international standard, I looked to see who else has it, and it appears that we're the only independent lab accredited to test to the International Standard for Sunglasses," says Henri. "So we're cutting edge." "I don't think there's any other optometry department in the country that does this. The other universities that have optometry courses don't have an OATS or anything like it. It simply happened that somebody who happened to live nearby who imported sunglasses came in and ask if we could test them. We could and it took off." With a new member of staff, Rian Love, starting recently it looks like the legacy of Henri and OATS will continue for a long time yet.